Do your citrus fruits have brown skin? It’s a common problem with citrus and is called Citrus Melanose. 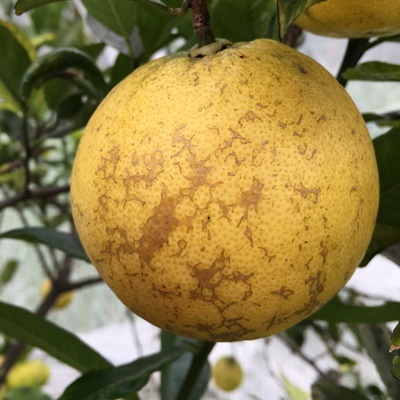 Citrus melanose is a fungal disease which will not go away by itself and tends to get worse each year. Citrus melanose shows as a brownish fine discolouration, that looks a bit like a stocking has been stretched over the fruit. It can be so severe that the skin of the fruit becomes hard, causing splitting as the flesh outgrows its skin. On the tree, you can usually tell even before the fruit form, if the disease is present, as leaves are spotted with dark grey spots which generally form underneath first. I recommend treating the disease each year once it shows itself on your tree, as the spores of the fungus will multiply in favourable conditions. The spores can stay dormant on the bark and leaves for a long time. Treatment can be undertaken using acceptable organic inputs. I recommend treating the condition early so fruit is not spoilt, and to follow a holistic tree care program for overall tree health. 1. Many citrus trees will spot flower throughout the year, so you will need to choose a time when there are no, or fewer flowers on the tree, as the sprays can cause flower drop. As the flowering buds begin to fall, spray with either Copper oxychloride OR Wettable sulphur. Spray both sides of leaves and all branches and stems. Repeat about 6-8 weeks later. 2. During winter or after pruning, paint the stems and trunk with Biodynamic Tree Paste. 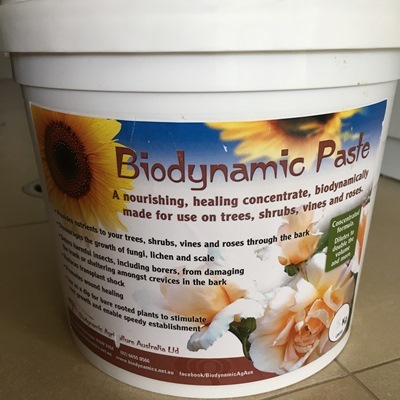 This is available to purchase through Biodynamic Agriculture Australia www.biodynamic.net.au I find this muddy looking substance to be a wonderful all-round treatment for all my orchard trees including the citrus. I paint it on with a paint brush saved for the job. 3. Ensure the tree is well watered and that the soil is not waterlogged. The pH for citrus is ideally around pH 6-7 to avoid deficiencies. Trees in acid soils suffer a range of nutrient issues. 4. Apply organic fertilisers 3 monthly to the moist root zone around the tree and ensure that the feeder roots are always covered with soil and mulch. Exposed roots lead to stressed plants. I don’t use chemical citrus fertilisers as we are organic growers. Chemical citrus feeds can cause defoliation of a whole tree. 5. Apply 2-3 monthly foliar feeds of Liggy Max (I always have it in stock) to feed the tree via the leaves. Email me to purchase some for your garden.